Definition at line 34 of file CQEFMNetReactionDM.h. Definition at line 28 of file CQEFMNetReactionDM.cpp. Definition at line 43 of file CQEFMNetReactionDM.cpp. Definition at line 56 of file CQEFMNetReactionDM.cpp. References COL_MODIFIER, COL_REACTION, COL_ROW_NUMBER, FROM_UTF8, CEFMTask::getInternalSpecies(), CEFMTask::getNetReaction(), mBeginModes, mpTask, and rowCount(). Definition at line 48 of file CQEFMNetReactionDM.cpp. Definition at line 87 of file CQEFMNetReactionDM.cpp. References COL_MODIFIER, COL_REACTION, and COL_ROW_NUMBER. Definition at line 135 of file CQEFMNetReactionDM.cpp. Definition at line 147 of file CQEFMNetReactionDM.cpp. 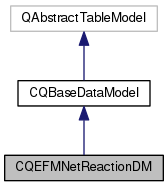 Definition at line 141 of file CQEFMNetReactionDM.cpp. Definition at line 35 of file CQEFMNetReactionDM.cpp. Definition at line 129 of file CQEFMNetReactionDM.cpp. Definition at line 114 of file CQEFMNetReactionDM.cpp. References CEFMTask::getFluxModes(), mBeginModes, mModesSize, mpTask, and pTask. Definition at line 61 of file CQEFMNetReactionDM.h. Definition at line 62 of file CQEFMNetReactionDM.h. Definition at line 59 of file CQEFMNetReactionDM.h. Referenced by data(), rowCount(), and setTask().